British Commando’s land on the Italian held Island of Castelorizzo in the Dodecanese. The British submarine, HMS Upholder, sinks the Italian Cruiser Armando Diaz to the southwest of Malta. British Nigerian troops of the 11th African Division occupy Mogadishu, the capital of Italian Somaliland, having advanced up the coast. The 12th African Division pushes up the river Juba in Italian Somaliland towards the Abyssinian border town of Dolo. First delivery of Martin B-26 Marauder medium bombers to US Army Air Force. After the withdrawal of ABDA HQ from Java, Wavell himself now leaves for Australia. The debate in the House of Commons comes to a close with many speakers being sharply critical of government policy, with the bombing of Germany being called in to question. The RAF begins a round the clock bombing campaign in Tunisia, with 2,000 raids in the next 48 hours. First time US Eighth Air Force (based in England) and US Fifteenth Air Force (based in Italy) bomb the same target—Regensburg, Germany. U-boats break off attack on Allied North Atlantic convoy ON-166; 15 of 49 ships have been lost since February 21. US reoccupies abandoned Kasserine Pass. In New Zealand, Japanese POWs attempt escape; 48 POWs and one guard killed. Convoy JW-57 (43 ships and 19 escorts) sailing the Loch Ewe to the Kola Peninsula, is attacked on 25 February off Norway. One destroyer, HMS Mahratta, is sunk by U-990 for 1,920Â tons. U.S. forces destroy 135 Japanese planes in Marianas and Guam. Turkey declares war against Germany. 400 RAF bombers carry out attacks against Dortmund and Rheine. 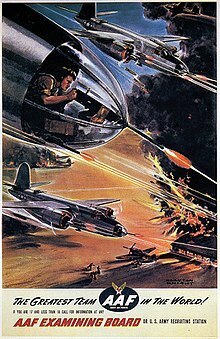 US Fifth Fleet carrier aircraft and B-29 bombers strike Tokyo in devastating raid. 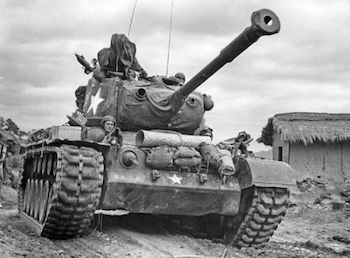 US M26 Pershing tanks are first used in combat in Europe, by the US 3rd Armored Division near the Roer River.